Well, I had been planning on showing this here since around the beginning of the year. It's technically still a work in progress, even though I have it all drafted out. But to clear one thing on this, nope. This is not the first time I've ever done a fic before, but it has been years since the last time I have done something like this. This is certainly TLK 1 1/2 (3) based and you'll definitely know whom it's about. I had a lot of enthusiasm/encouragement especially when I first started writing this later last year and it's something I hold very special. It is focused on their relationship, their love that they have for each other and emotional intimacy, and comes about after what is seen from this part of the film or you can think of it where Timon is simply an adult just like in his film. This is about the first half I'm showing below in this post and you'll probably notice it's written in present tense because it feels a lot more real to me every time I read it this way. Only nice, thoughtful and/or constructive feedback. Thank you. Timon is awakened during the middle of the night on his large hammock to see Ma standing there in front of him. She initially seems to not be at ease. "Hi Timmy." Ma tells her son softly. "I'm sorry I woke you up right now honey." The only light shining on them is from the moonlight above, lighting the area of the jungle paradise where they are at. "What's going on Ma?" Timon says in a waking tone and sits up on his hammock. 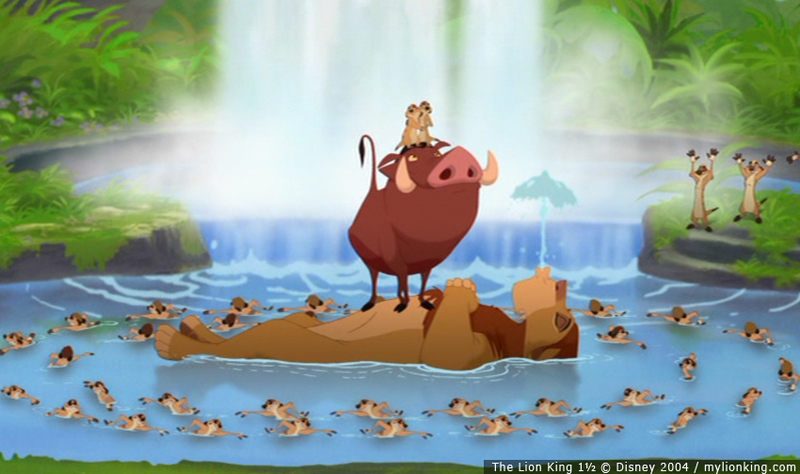 "Oh, it's nothing serious, Timon. But I couldn't sleep right now. So I thought I would come over here for a short while to be with you since I was over there where Uncle Max is. But he's fast asleep. If you're too sleepy to stay awake right now, I'll let you go back to sleep." Timon realizes quickly that his mother wants to be with him. So he didn't want to displease her and also because he notices that something is bothering her inside. He cares enough, even this late in the night, in wanting to know what was distressing Ma. "Oh no, Ma." He says calmly. "You can stay here with me if you want to. It's not like I haven't gotten any sleep at all tonight, you know." He gives her an assuring smile with his hands together over his lap but still trying to wake up. "Thank you, sweetie." Ma beams. She then sits on the other side of the comfortable but sturdy hammock opposite from where Timon is sitting, but still right next to him with her hands placed on her side. Timon yawns briefly and then turns to his mother who is now sitting next to him on his right side. "You seem to be bugged by something. Are you feeling all right Ma?" Timon asks with concern. "Well, as I said, I wanted to come over and be with you for right now, honey." Ma replies a little tensely, in which Timon senses but she continues. "But I feel better now that I'm here." She turns to smile at him. "But it's just..., well, I've been thinking about how things are going to be between us now that you've become so well-liked around the colony and at the Pride lands with Simba, and we're now living in this paradise. This place isn't like it was where we were so used to living in." Ma explains. "I mean, I'm very happy that you've done great things for all of us and that we're living in a much better place, Timon. But I feel that with everything going on in your life now... Well..., I guess I'm still not use to seeing you like this, since you left the colony to find what you were looking for." Timon is wide awake now. It seems that after what Ma has just told him, she does feel better. Though, he remains silent with only the sounds of the jungle persisting around them, and looks at the area in front of him for a moment to scratch his red moonlit hair, while carefully thinking about Ma’s words. "You know that I'll never abandon you, Ma." He begins to truthfully say with a confident tone. "You're my own mother. And, while I'm here with you and the colony, I'll still spend time and look after you. Just like you've always done for me, since I was born." Timon puts his right arm over his mother's shoulder with a caring smile and looks directly into her eyes. "I'm thankful to be your son and I love you with all that I am." As Timon says this, he notices Ma beginning to finally relax as he continues. "I know you sometimes love to hug me until I'm choking and not breathing, and mess with my hair until I can't stand it anymore. But you'll always be my mom and I can surely live with that. I mean, I should be able to now, if I have made it this far in my life. You know..." He moves his eyes down to the side for a second. "Alive... and still sane…, I think." Timon chuckles and nearly laughs in amusement from hearing what he has just said while very briefly moving his head to look down. He also notices that his mother chuckles at the same time he does too, but only somewhat. Timon then looks directly back at Ma and pats her shoulder for just a second. "You know, you've really got nothing to worry about Ma. This is a perfect place for all of us..." He pauses when a concerning thought comes into his mind. "You do like living here in our new home. Am I right?" He asks his mother with an initially small sense of concern on the matter. "Of course I do, Timmy." Ma quickly replies, almost sputtering out her words but with an open smile while Timon looked at her bleakly after hearing her response. "I'm sorry if I made you get concerned about me right now, but I really am, and it's true that we're all safe and living well here just like you've said. This is a great place and... Well... I do love you, honey. You've really have come a long way Timon and I always knew you would make me happy no matter what. But you are my very special son and hero to all of us. You did do the right thing and I'm very happy and thankful because of everything you've done for us, sweetie." Last edited by Timon the great on October 7th, 2014, 6:31 am, edited 10 times in total. Awww! This so cute and touching! A Mom-son relationship. ^Thank you for your reply/support to my work. Well, based on the positive responses I've gotten so far on this, I'm going to post another two full paragraphs worth on here for now. *Much more feeling is to be expected from here on out (you have been warned), and is something I feel should've definitely been shown between Timon and Ma in Lion King 1.5 (3) all along. "Oh, well, thank you Ma. It feels really good hearing those words from you. And... I love you too." He slightly but caringly rubs the fur on his mother's shoulder as well for a second. A few seconds later while their eyes continue to make contact and deeply smiling at each other, Ma then moves her left hand to caress the back of Timon's head and very thin, beautifully long neck. He lays his dark-tip hands on the surface of the hammock and his face begins to brighten as great warmth grows in his body as his biological mother's deep love envelopes him and he can no longer move his eyes from her. While verbal silence continues between them, they continue to smile deeply at each other. With both humanized meerkats now completely relaxed, Timon slowly closes his eyes and gives out a sigh of feeling while raising his head and lowering his shoulders in submission to his mother's love. She continues to affectionately rub the back of his head at the bottom of his red point-like hair line and his soft and smooth, thin neck. Last edited by Timon the great on July 24th, 2014, 3:39 am, edited 3 times in total. This is so cute, it ought to be illegal! I love the touching relationship that you have between Timon and Ma and it is heartwarming. Zazulover4915 wrote: This is so cute, it ought to be illegal! Ha ha! I actually laughed in person when I read that. You seem to be really intrigued by my work, which is good and I've only shown half of it on here so far. My intention was to not actually make it cute; Lol. But something that I've always felt (since I saw TLK 1 1/2 in its entirety back in mid-2012), should've been shown about Timon and Ma from this film since it makes it clear that their relationship is deep. Despite the somewhat limited scenes on them. I did want to make it loving and it does give me deep feels all of the time, especially the second half. It's not something I was thinking I would be able to do in the beginning before I actually started typing it. Though, I really thank you for your continued support. I'll be posting the next part of it soon, on here and/or on FF.net: https://www.fanfiction.net/s/10434966 , if you must know. Last edited by Timon the great on June 28th, 2014, 6:19 am, edited 1 time in total. I''m glad that you're are going to update soon! I shall stalk you, until you update. Fan-tas-tic. I would love to read more. And these wordscame from a fanfic-hater. Alright then. I feel that I've gone a longer than I wanted to on updating my fic here. Before I post more of it below this standard text, keep in mind as I had noted in my earlier posts in this topic that, A lot more feeling is to be expected from here on out. So with that in mind, I will be giving out only another two or three paragraphs worth again and probably for the rest of bringing out this work. One reason why I'll be doing this too, is to allow people to slowly "swallow" what is read between these two lovely humanized meerkats. Now that those things have been said above; forward. Timon slowly moves his head forward due to the deep physical affection coming from Ma and she puts her hands along the bottom sides of his wide mouth, lovingly supporting her son's head with them. Timon slowly opens his eyes looking directly into Ma's, feeling inside himself as being born again, with a very loving smile and his dark-colored eyelids halfway open. Ma gently moves her humanized meerkat fingers down to the top of Timon's human like neck, tender to touch. Just below his back hairline briefly rubbing and lovingly squeezing it and then pulls him up next to the bottom of her face, nearly nose to nose, stretching his slender neck. Last edited by Timon the great on September 8th, 2014, 11:29 pm, edited 5 times in total. Perrys Girlfriend wrote: This is so cute, it ought to be illegal! This fic should be illegal for a lot of reasons.